mz D i D i: Finally went out !!!! Yes so I finally went out on a Friday night after weeks & weeks of staying at home (Actually it was just 4 weeks but that's just as long). So i had stirfry while my friend had thai curry, that was hot! Like as in burning hot! I took one spoonful & my tongue was burning =_= I don't get how people can enjoy eating spicy & chilly food >o< We also both a drink each. To get to the good part we had DESSERT!!! 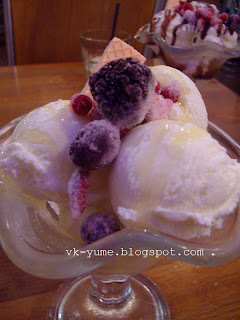 ICE-CREAM!!! My photography skills are lacking but it was soooo yummy despite the fact the photo does no justice. I am totally going back there for moarrr!!! !